...are perfect for a romantic retreat. The Goose & Gander cabins—the log construction just adds to the feel of the country--a cozy place to stay! Each of these cabins has a bedroom with a comfortable queen bed and the propane fireplace. There is a mini-kitchenette with microwave, toaster, coffee maker, stove top, refrigerator but no oven; shower stall bathroom; a living room with a double bed futon and an entertainment center with a flat screen Satellite TV and DVD player; and a loft area with a double bed. The cabins are set up to sleep 6. The cabins have heat and AC. The cabins are 'pet friendly' and 'smoke-free'. On the patio under each cabin is the 6-person Hot Tub and nearby a picnic table and charcoal grill along with a fire ring for the perfect bonfire. There is a large parking area with easy access in the winter and perfect for street bikes. 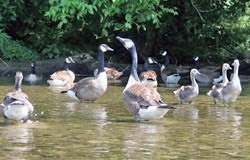 The #1 Mother Goose has a King bed bedroom and a full bathroom. In the loft, there are 2 Queen beds, and a shower stall bathroom. There is a full kitchen and a relaxing living room area with reclining sofa in front of the propane rock fireplace and large TV. The 6-person hot tub is on the deck. There is a washer and dryer down below with the ‘game room’. Please call for other quotes. Taxes (10.3%) not included in rates. Required deposit: One half of rental fee Full payment 2 weeks in advance. Cancellation fee—$40 Deposit is refundable up to two weeks in advance. 1/2 of full payment refunded if canceled between 14 days to 7 days before arrival date. No refund in the last week before arrival date. If necessary--Damage/excessive cleaning charge: $100 min. Maximum of 6 people in each cabin. No camping at cabins. We furnish a canoe at each cabin. You must download, sign and send to us this wavier before we will give you the combination lock code for the canoe lock. You can scan and email the signed wavier back to us and then leave the signed wavier at the cabin when you check out. We have adult life jackets but you need to bring the correct sized children life jackets. You must have life jackets in the canoe for each person. Please make reservations well in advance. Check our calendars for dates that work with your schedule. Please call or email any questions. 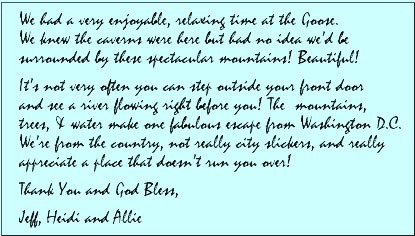 The Gander Family looks forward to showing you our lovely cabins and sharing the splendors of the Shenandoah River, the Shenandoah Valley and the mountains with you. We know you will love the area as much as we do. 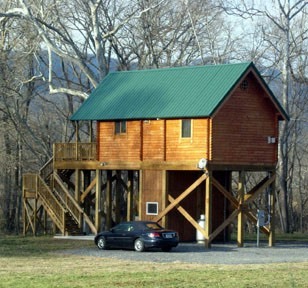 The Gander Island cabins are part of the Shenandoah Valley farm that dates back to the 1700's. This 5th generation farm family, David, Lisa and Kathrine Gander, raise cattle, hay, grains and chickens on 250 acres carrying on the traditions of generations. David and Lisa wanted to supplement their farm income by building and operating the four rental cabins and sharing their farm and the area with you. We would like to thank all of our repeat guests for returing and all the wonderful reviews, emails and comments in our guest book. Check out the Attractions and the Restaurants in our area. So much to see, do and enjoy!